Frozen shoulder (also called “Adhesive Capsulitis”), causes pain and progressive stiffness in the shoulder. Frozen shoulder occurs in about 2% of the general population. It most commonly affects people between the ages of 40 and 60 and is more common in women. Your shoulder is a ball-and-socket joint made up of three bones: your upper arm bone (humerus), your shoulder blade (scapula), and your collarbone (clavicle). The head of the upper arm bone fits into a shallow socket in your shoulder blade. 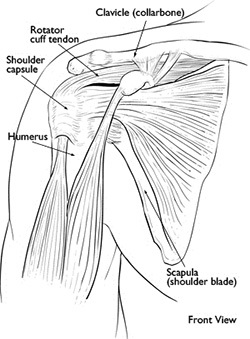 Strong connective tissue, called the shoulder capsule, surrounds the joint. To help your shoulder move more easily, synovial fluid lubricates the shoulder capsule and the joint. What happens in a frozen shoulder? The shoulder capsule thickens and becomes tight. Stiff bands of tissue (called adhesions) develop. In many cases, there is less lubrication fluid (synovial fluid? in the joint. The main symptom of this condition is having limitation of movement of your shoulder in all directions. Freezing: In the “freezing” stage, you slowly have more and more pain. As the pain worsens, your shoulder loses range of motion. Freezing typically lasts from 6 weeks to 9 months. We don't fully understand the causes of a frozen shoulder. There is no clear connection to arm dominance or occupation. A few factors may put you more at risk or is associated for developing frozen shoulder :. Diabetes: 10-20% of individuals with diabetes are affected. The reason is not known. Other diseases: Thyroid problems, Parkinson's disease, and heart disease. Pain from frozen shoulder is usually dull or aching and can be very severe. It is typically worse early in the course of the disease and when you move your arm. The pain is usually located over the outer shoulder area and sometimes the upper arm. You may experience pain at night and may have difficulty sleeping on the affected side. Physical Examination: After discussing your symptoms and medical history, your doctor will examine your shoulder. Your doctor will move your shoulder carefully in all directions to see if movement is limited and if pain occurs with the motion. The range of motion when someone else moves your shoulder is called “passive range of motion”. Your doctor will compare this to the range of motion you display when you move your shoulder on your own (“active range of motion”). People with frozen shoulder have limited range of motion both actively and passively. X-rays: X-rays may show other problems in your shoulder, such as arthritis. Ultrasound: Cost-effective way of excluding other causes of pain or stiffness. How will you treat my frozen shoulder? Frozen shoulder generally gets better over time, although it may take up to 3 years.The focus of treatment is to control pain and restore motion and strength through physical therapy. Nonsurgical Treatment: More than 90% of patients improve with relatively simple treatments to control pain and restore motion. Non-steroidal anti-inflammatory medicines. Drugs like diclofenac and ibuprofen reduce pain and swelling. Steroid injections. Cortisone is a powerful anti-inflammatory medicine that is injected directly into your shoulder joint and subacromial bursa. Physical therapy. Specific exercises will help restore motion. These may be under the supervision of a physical therapist or via a home program. Therapy includes stretching or range of motion exercises for the shoulder. Sometimes heat is used to help loosen the shoulder up before the stretching exercises.Below are examples of some of the exercises that might be recommended. 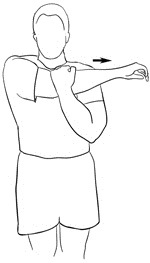 External rotation — passive stretch. 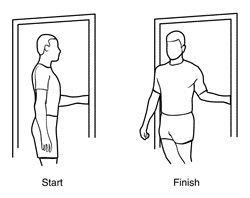 Stand in a doorway and bend your affected arm 90 degrees to reach the doorjamb. 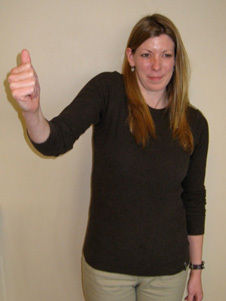 Keep your hand in place and rotate your body as shown in the illustration. Hold for 30 seconds. Relax and repeat. Manipulation under anaesthesia: Under general anaesthetic your doctor will force your shoulder to move which causes the capsule and scar tissue to stretch or tear. This releases the tightening and increases range of motion. 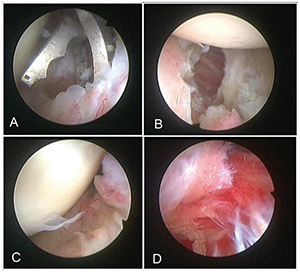 In many cases, manipulation and arthroscopy are used in combination to obtain maximum results. Most patients have very good outcomes with these procedures. Physiotherapy is necessary to maintain the motion that was achieved with surgery. Recovery times vary, from 6 weeks to three months. Although it is a slow process, your commitment to therapy is the most important factor in returning to all the activities you enjoy. Long-term outcomes after surgery are generally good, with most patients having reduced or no pain and greatly improved range of motion. In some cases, however, even after several years, the motion does not return completely and a small amount of stiffness remains. Although uncommon, frozen shoulder can recur, especially if a contributing factor like diabetes is still present.